Inuit Nutaat puts an existing, traditional public sculpture in a new, dynamic frame, and shines a new light to build understanding, community and empowerment. The installation will serve as a spectacular setting for social efforts aimed at creating a more balanced perception of the Greenlander. 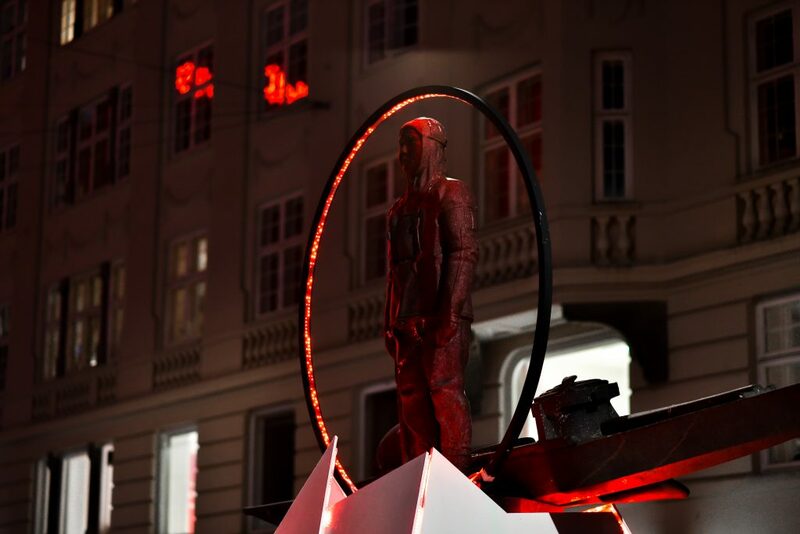 Inuit Nutaat is a light art installation for Copenhagen Light Festival 2019, which uses Svend Rathsack’s “The Greenland Monument” at Christianshavns Torv to create understanding, community and empowerment. With Copenhagen Light Festival as a frame, this project will literally put the Greenlander in a new, dynamic and dramatic light on the very same Christianshavns Torv, where marginalized young Greenlanders gather daily, and which at the same time is a hotbed for prejudice about Greenlanders. The Greenland Monument was created by Svend Rathsack in 1938 after a visit to Greenland. It consists of three sculptures: a hunter with a kayak, on a tall footing, flanked by two lower sculptures depicting working women. The sculptures are features benches and are today a place where marginalised Greenlanders (and Danes and people of other nationalities) gather. The people are often homeless and alcoholic, which also contributes to reinforce prejudices that bypassers might have about Greelanders. The Greenlandic House in Copenhagen regularly uses Christianshavns Torv as a location for events focused on nuance prejudice and inform citizens of the factual, modern Greenland and the Greenlanders. I collaboration with The Greenlandic House in Copenhagen and Nordatlantens Brygge, SIIKU will use The Greenland Monument as a stage to reframe “the Greenlander”. The light artwork will shine a new light upon the sculptures and make a spectacular setting for the efforts aimed at create a more balanced perception of the Greenlander. The artwork pushes the very traditional sculptures into the new millennium with a minimalist and futurist aesthetics. The tall footing will be surrounded by sharp angled, white panels with glowing edges, as a technological reinterpretation of the Greenlandic nature with snow covered mountains and icebergs. The hunter is framed by a circle equipped with dynamic lighting. This circle refers to the Greenlandic flag, and puts the Greenlander right in the centre. The title, Inuit Nutaat, is Greenlandic and means “New people” and refers to the citizens of the northernmost outpost of the Danish Kingdom as a more complex and modern existence than prejudices and the Greenland Monument itself imply. Inuit Nutaat is also a wordplay on the title of a famous album from the groundbreaking Greenlandic rockband, Sume, Inuit Nunaat, translated “The Country of the People”. The sculpture will be 4-5 meter high. SIKU means ice in Greenlandish. Inuit Nutaat means New people.